It’s a photograph.Why does it look so unreal? Some call it abstract photography; others, abstracted reality. The camera transforms real images into patterns, shapes, colors, and designs. Like an abstract painting, you assign meaning.Most will try to guess what they see. Let imagination take hold – what do YOU see? Is it ordinary or extraordinary? Can you see yourself in the abstract? 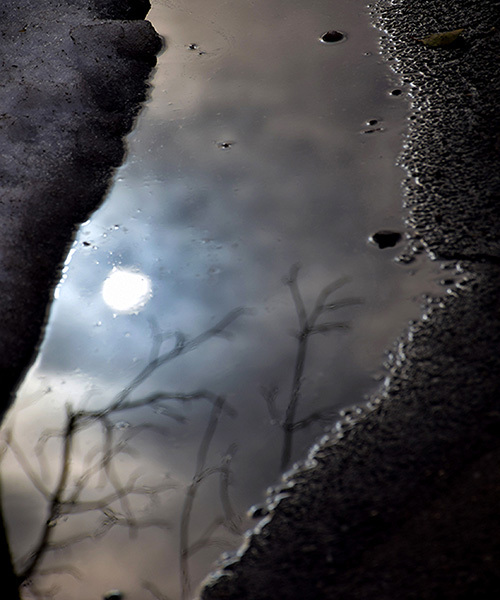 This is a photo of a dirty, melting snow puddle reflecting the sky. Yet it’s magical. Not sure Why, but my immediate feeling seeing this Brought me yo my youth. Melencohly but at the same time, a feeling of warmth.